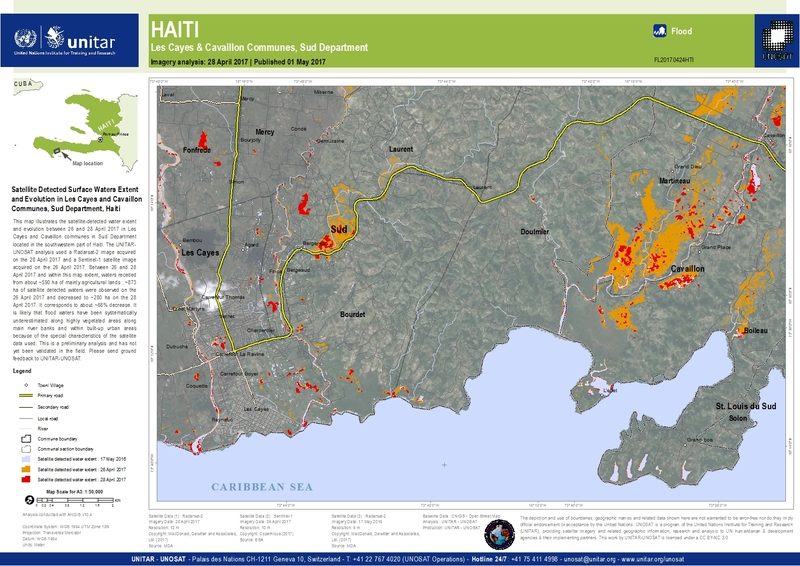 This map illustrates the satellite-detected water extent and evolution between 26 and 28 April 2017 in Les Cayes and Cavaillon communes in Sud Department located in the southwestern part of Haiti. The UNITAR-UNOSAT analysis used a Radarsat-2 image acquired on the 28 April 2017 and a Sentinel-1 satellite image acquired on the 26 April 2017. Between 26 and 28 April 2017 and within this map extent, waters receded from about ~590 ha of mainly agricultural lands : ~873 ha of satellite detected waters were observed on the 26 April 2017 and decreased to ~280 ha on the 28 April 2017. It corresponds to about ~68% decrease. It is likely that flood waters have been systematically underestimated along highly vegetated areas along main river banks and within built-up urban areas because of the special characteristics of the satellite data used. This is a preliminary analysis and has not yet been validated in the field. Please send ground feedback to UNITAR-UNOSAT.